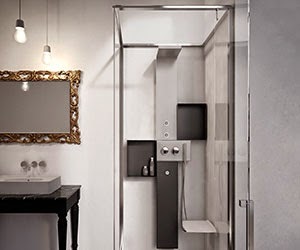 While the images shown here are beautiful steam shower enclosures, the real beauty lies in what you can not see - water vapour. For millenniums this planet has offered up great reserves of this vapour that the populace quickly appreciated as having wondrous effects on the body and mind. Think hot springs, Turkish baths, Roman baths . The Victorians embraced the idea of a Turkish bath, however theirs was full of hot air, and not steam. The Islamic hamman originating in Turkey was steam. 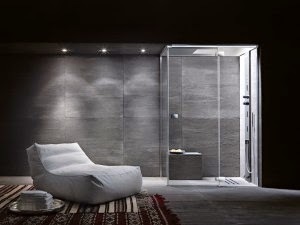 While the recommendation for steam showers is to be used moderately, 20 minutes at a time is the advice, the benefits are enormous to health. The effect of increased temperature on the body raises the pulse rate, this allows the blood vessels to expand thereby improving blood circulation. Bacteria and viruses hate this effect and cannot ordinarily survive. The pores on the skin open, and toxins are sweated out, thereby having a detoxifying effect unblocking clogged pores. By the same nature breathing is improved. Endorphins are released which has the effect of reducing stress and relaxing muscles. Through sweating some excess body water can also be lost. It is therefore unsurprising that steam was, and still is, popular. While the use of it was largely relegated to communal areas or the enclaves of gyms and spa resorts, it is becoming increasingly more popular within the home. Sealed units with seating and compact generators allow a neat solution in smaller spaces. For the health conscious family a steam shower is ideal to prevent bacteria remaining in the body, reduces stress and improves the immune system. A small price to pay for good health and wellness. Ask our recommended specialist for more information.